"This is a great, fresh summer side dish with sauteed zucchini, garlic, carrots, balsamic vinegar, and the bright taste of fresh lemon juice. It goes great with any meal." Bring a large pot of lightly salted water to boil. Add orzo, and cook until al dente, about 8 to 10 minutes. Drain, and set aside. Meanwhile, warm olive oil in a large skillet over medium heat. Stir in onion, garlic, and carrot, and cook for 2 minutes. Stir in zucchini, and cook for 2 minutes more. Pour in 1 tablespoon balsamic vinegar, and deglaze pan. Reduce heat to medium low, and season with salt and pepper. 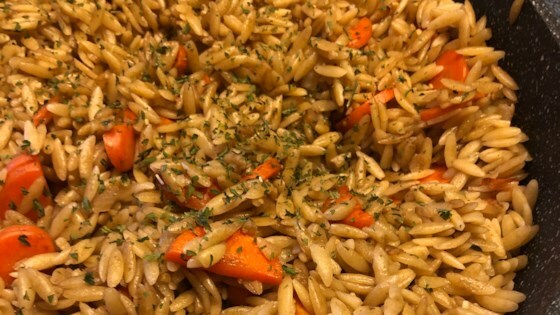 Add orzo to skillet, then stir in remaining 1 tablespoon balsamic vinegar and lemon juice. The cooking of the veggies took away their fresh flavor. I believe this would have tasted best wiith raw veggies with the vinegar, olive oil, lemon juice and seasonings used as a dressing. Excellent! My family loved it. I added a pinch of sugar to mild the taste a bit. It was also good as leftovers. We thought this was very good. Added some needed seasonings and sprinkled with a bit of parm. Thanks! Yummy! I didn't have any balsamic vinegar so I added a a balsamic vinegarette dressing and it came out pretty good still. This recipe was OK, but nothing special. I cut the oil in half---glad I did or it would have been too greasy. I threw away my left overs.